Rose Cullen is Assistant Curator of the current exhibition Touring the Past at the Macleay Museum at the University of Sydney. She won the 2011 Max Kelly Medal awarded by the History Council of New South Wales and is a PhD student at the University of Sydney researching home renovation in late twentieth-century Australia. View of Circular Quay about 1890, the old convict ship Success moored to the wharf ca. 1890 / nla.pic-vn3415591. Rose Cullen reveals the amazing story of the Success, one of the most elaborate tourism enterprises in colonial Australia. 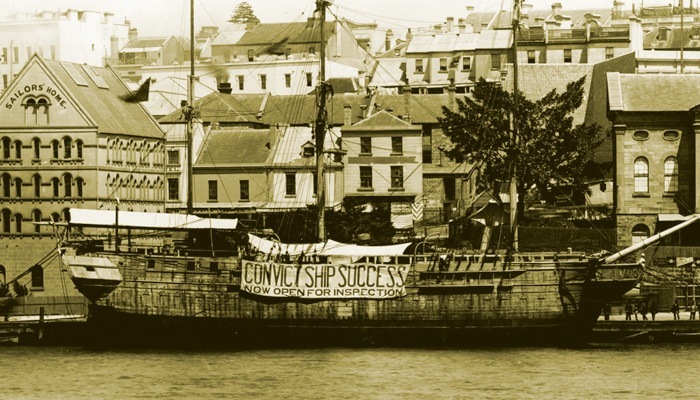 An old prison hulk from Melbourne, the Success was transformed into a floating museum of convict Australia. Its lurid displays of wax figures and convict manacles attracted large crowds in Australian ports in the early 1890s, before touring Britain and North America. A visit to the ship appealed to our lingering curiosity about the convict origins of the Australian colonies. 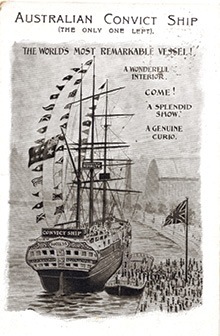 The exhibition was promoted as a true object lesson, however historical accuracy fell victim to showmanship and visitors were sold an increasingly sensational version of Australia’s past.